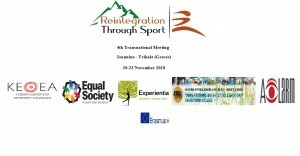 The Reintegration Trough Sport project 4th transnational meeting will be held in Ioannina – Trikala (Greece), 20-23 November 2018, and will be hosted by the project partner University of Thessaly. The main goal of the meeting is the development of the Training Tool structure. The process to be followed will be based on the ADDIE model, which is represent a dynamic, flexible guideline for building effective and innovate training tools. The first day of the meeting will be hosted by the KETHEA EPIROU Therapeutic Community in Ioannina. During the meeting a bicycleroad will take place with the participation of therapeutic community members, students of the Physical Education Department of the University of Thessaly as well as all the project team members in order to empowering the interaction between young people and connect them with the project goals.